Welcome to the Northside Bar and Grill of Bend on the web. This week , once again, we have another excellent line up for you! If you have not visited us before, you are missing out on some awesome food, reasonably priced drinks, and excellent music. We offer breakfast on Saturday and Sunday. The choices are traditional and inexpensive and the Bloody Mary for $5 continues. Sports year round on our 6 high def screens including a new 12' x 12' screen. All TVs are in high def and we will accommodate you with reasonably priced pitchers of beer, drink specials, and food specials during the games. Make the Northside Bar and Grill your favorite place to relax and have fun. We have extended our "happy hour" (Mon. - Sun. 3 to 6), Domestic cans: $2.75, domestic draft: $3.25, domestic bottles: $3.25, Microbrew draft: $4.25, well drinks: $4.25. 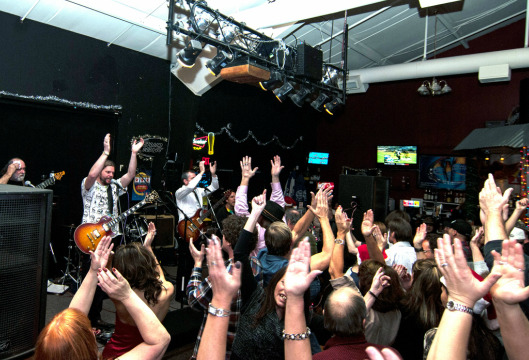 We continue to offer no cover on live music nights except for Friday and Saturday! We currently offer live music on Tuesdays (Jazz Night), Wednesdays (Acoustic Open Mic with Derek Michael Marc, Thursdays (local bands), Fridays & Saturdays (the best live bands in town). Did we mention that there is a dance floor so you can dance the night away? Daily specials and higher quality ingredients have been added while keeping the prices low. We have great things in store for you so please check our calendar for upcoming events and don't forget to like us on Facebook.